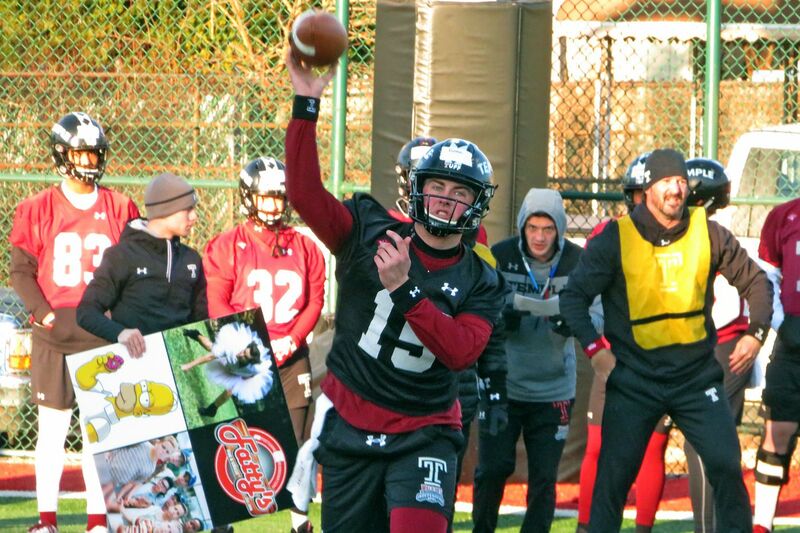 Temple quarterback Anthony Russo throws a pass during the first day of spring practice. Rod Carey, who has been on the job as Temple’s head football coach for two months, had a good impression Tuesday after the opening of spring practice. Carey came to Temple after serving as head coach the previous six years at Northern Illinois, where he complied a 52-30 record and guided the Huskies to two Mid-American Conference championships. Carey said there is open competition for all positions. He praised returning quarterback Anthony Russo, along with the other top two returning QB candidates: redshirt sophomore Todd Centeio and redshirt freshman Trad Beatty. The new coach said he will need time to make true evaluations of the players. One of the biggest goals for the players is adapting to yet another new system. For many upperclassmen, Carey is their third head coach, after starting with Matt Rhule and playing the past two seasons for Geoff Collins, now at Georgia Tech. Carey said he had no update on whether Baylor transfer Harrison Hand, a junior cornerback who enrolled at Temple in January, will be immediately eligible. NCAA rules mandate that a player sit out a year upon transferring, but sometimes grants a waiver for various reasons. Hand, a former Inquirer all-South Jersey performer from Cherry Hill West, transferred home for family reasons, according to several people familiar with the situation. Temple has filed a waiver to the NCAA, but Carey said he hasn’t heard back yet. The Owls are looking to replace cornerback Rock Ya-Sin, who should be a second-day NFL draft choice. Carey presided over the team during winter workouts, but that isn’t the same as a formalized spring practice setting. The Owls are coming off an 8-5 season, and the new coach inherits an experienced team that should compete for the East Division title in the AAC.